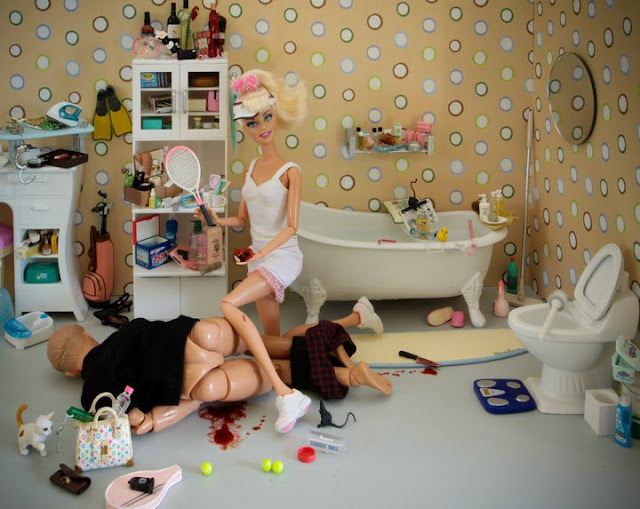 Mariel Clayton hates Barbies, for many cliche reasons. 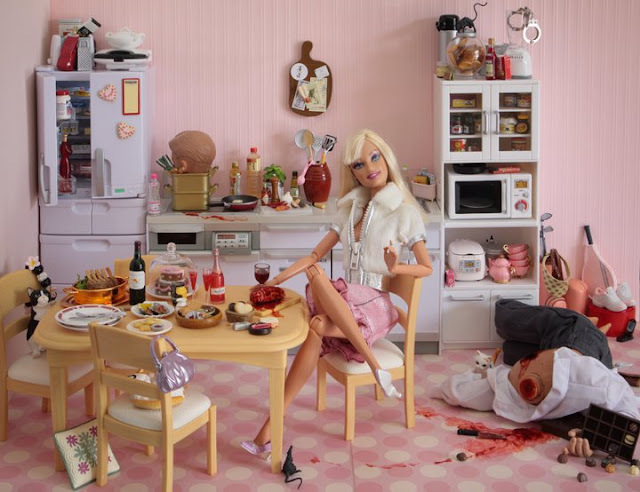 So when she's older and becomes a photographer, what better way to take revenge than portraying Ms Barbie as the victim of her own vanity, or better, a blond psychopath who victimizes Ken? 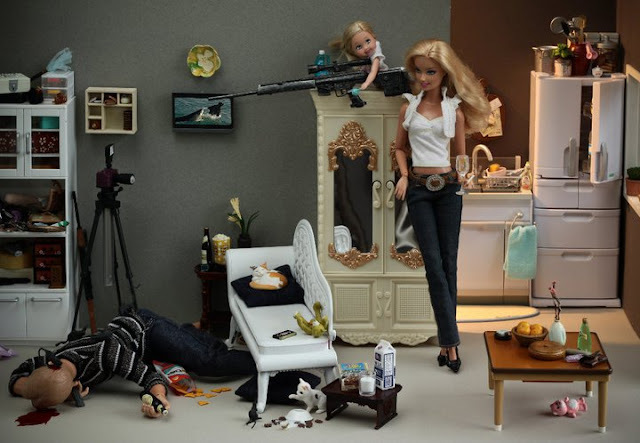 ‘You can’t get to be Barbie without an ocean’s worth of peroxide, 27 plastic surgeries and a complete lack of intelligence, so it irritates me immensely that this is the toy of choice women give to their daughters to emulate. Behind the vacuous perpetual lipsticked-smile lurks the black heart of the true sociopath, just like in real life’. I thought I told you, let her finish unpacking the food and THEN run her over!! For you Valentine.. a piece of my heart! 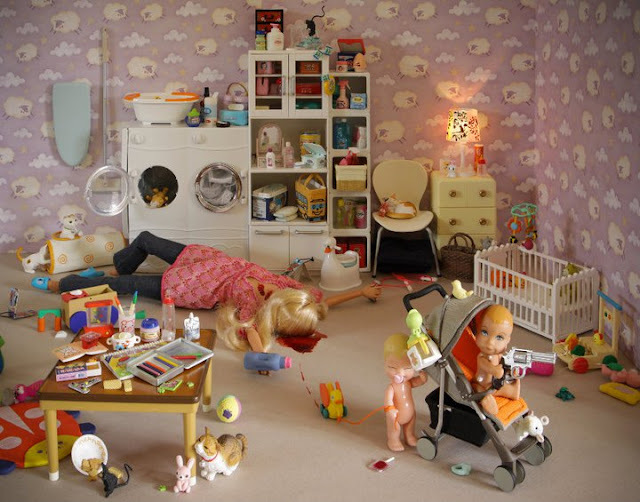 I can't even go shopping for a few minutes without you making a mess! Mariel also attacks Ken's masculinity by making him gay / crossdressing lots of time. Pokoknya si Ken nih, hobinya jadi dendong dan pake baju cewek. Hysterical! Aside from breaking stereotypes. 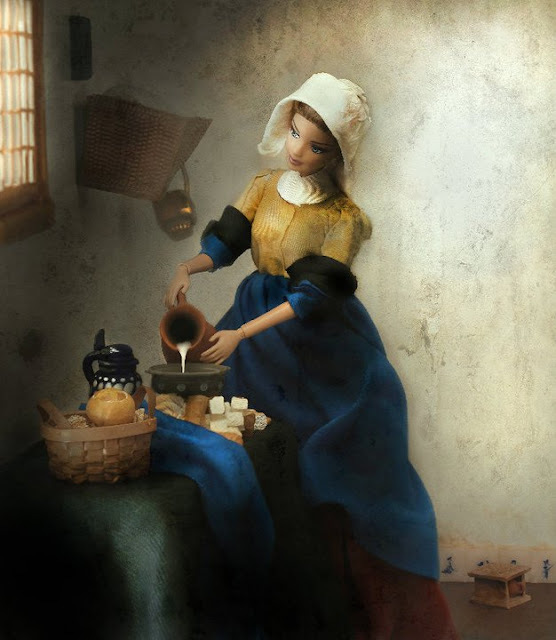 Mariel also uses Barbie to recreate depictions of artworks, historical figures, fairy tales, and many others. 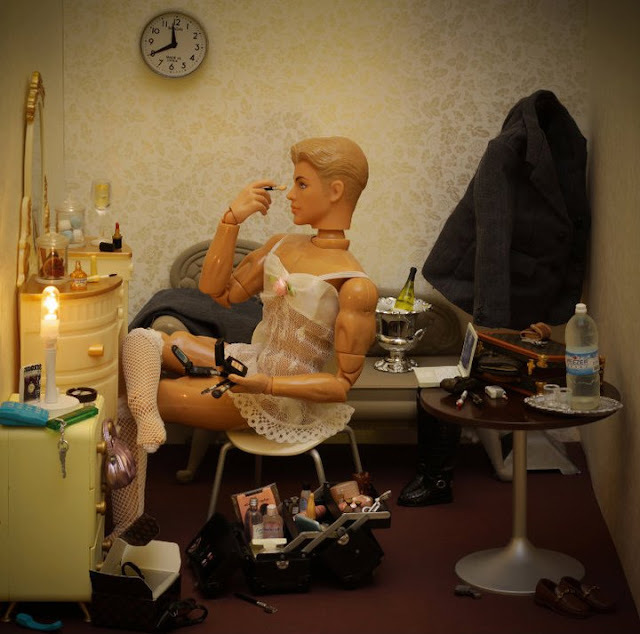 Some are very sexually graphic and NSFW (which is sad, by the way, because these dolls don't have genitalias), but some are also delicate and tender. ... and my favorite piece ever, based on an old Japanese poem. Still adding Mariel Clayton to my artist-to-take-notice list, though. I say, dari hasilnya dia doski sebenernya hobi main Barbie and Ken juga. 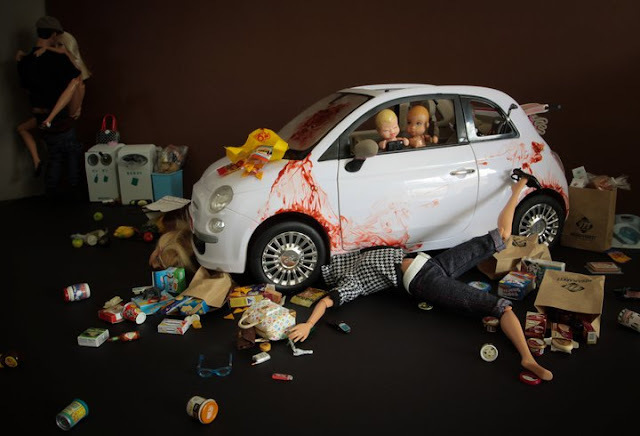 Hence, all the set ups and dress the dolls up. itu properti si barbienya cakeb2 bgt yaak, detaaiill bangeett ampe ada tikus2an sgalaa pless sikat WC iihh sinting..
Nandia: Kan dia baru koleksi miniatur setelah motretin Barbie... Early worksnya, si Barbie nggak ada yang pake pernah-pernik sih. Indah: Iya, seru ya? Pernak-perniknya bukan dari Barbie set sih, tapi pesen terpisah dari Tokyo. 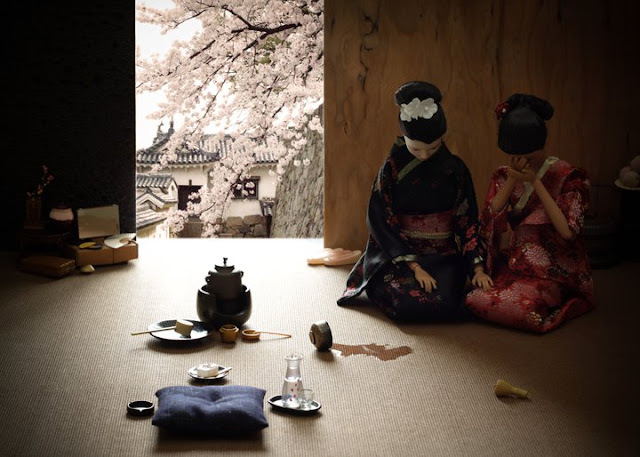 Jepang emang rajanya miniatur. Dan kebetulan skalanya pas sama si Barbie. Edan!